Embarrassing doesn’t begin to describe this. 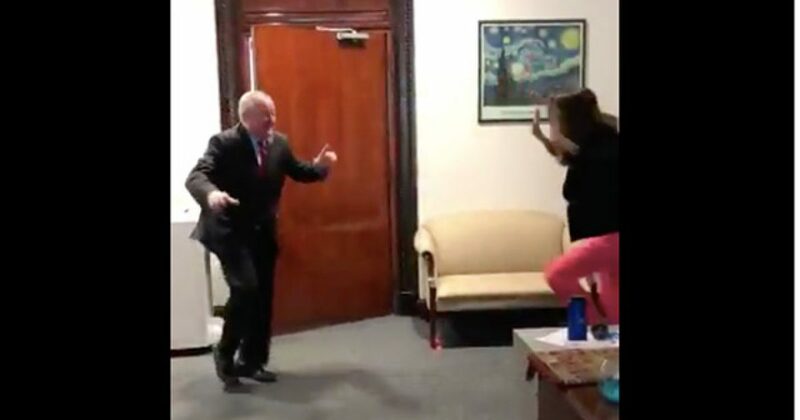 Philadelphia Mayor Jim Kenney was simply tickled pink with the ruling that Philly would now be called a sanctuary city, so thrilled was he that he broke out into a ridiculous looking happy dance that was caught on video. Unfortunately for him, this video caught the attention of the Department of Justice who was not at all happy with his reaction, particularly since this ruling will help the city protect violent criminals who are in this country illegally, which essentially means that Kenney is helping to create more potential victims for these scumbags. “Yesterday, the Mayor of the City of Philadelphia danced in jubilation over a court ruling that will allow him to continue to protect known and suspected criminal aliens in the City’s custody. These are individuals who have victimized the residents of the City he has sworn to protect,” DOJ spokesperson Devin O’Malley told The Daily Caller Thursday. It’s horrific to see a mayor, a man who is supposed to be a leader who stands up for the rights of his people, celebrating a measure that will inevitably create victims of violent crime on the streets he’s supposed to help protect. What makes it even more despicable is that he seems to care very little for backing and supporting the laws of the land, the very laws passed by Congress, created by legislators that were elected to their offices by the will of the people.